Why study at the Monash BDI? Why study in Melbourne, Australia? Monash University is committed to translating research into real-world solutions that make a difference. 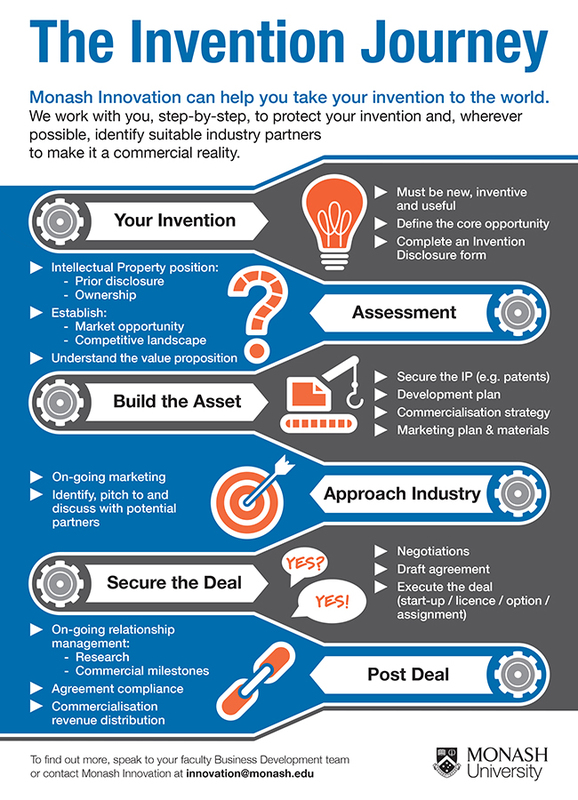 The commercialisation process is a way of developing innovative ideas and innovations and applying them to real-world problems. The diagram below shows the standard process in the commercialisation of inventions and intellectual property that are developed in an academic research environment. Use it as a guide only, as each invention has different requirements and we work with you to maximise the chance of commercial success. Authorised by: Chief Marketing Officer, Strategic Marketing and Communications. Maintained by: FMNHS Web Team. Last updated: Sep 2018.